wow. I don't think I ever knew his music. tragic, and of course, like Biggie and Tupac, reflective of the violence that takes the lives of many non-famous young black men. This one impacted me much more than other recent rapper deaths, I haven't felt this bad since Phife Dawg passed. It's so senseless and it all comes down to jealousy, I can't imagine wanting to kill someone simply because they have more than me. Victory Lap was one of the best albums last year. Everyone should listen to his song "Double Up" if they're unfamiliar his work. He will be laid to rest the same day as my younger sister's birthday. She passed away, as well. Thank you very much. Appreciate that. I am so sorry for your loss, Battle. My younger sister passed away back in August 2003. "We must stop this senseless violence," Moore added. 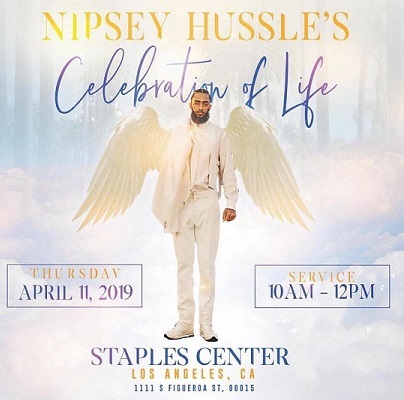 Enormous crowds gathered Thursday to pay their respects to Hussle as his body was carried from the public funeral at Staples Center to South L.A. where he was born and raised. Born Ermias Joseph Asghedom, the 33-year-old Grammy-nominated rapper and community activist was killed March 31. Days after the killing, Eric Ronald Holder, 29, was arrested in the city of Bellflower, southeast of L.A. by deputies from the Los Angeles County Sheriff's Department. He has since been charged with Hussle's murder. Holder is being represented by Chris Darden, who made a name for himself as a prosecutor during the mid-90s O.J. Simpson trial. Holder remains in jail on $5 million bond.